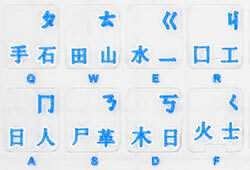 Chinese transparent keyboard stickers. The colour of letters is Blue. The labels are self-adhesive and die-cut for simple peel-and-stick installation. The position of each sticker on the keyboard is specified. The application processes doesn't take more than 10-15 min. The stickers are made from high-quality transparent (clear) matt vinyl. Thickness - 80 μm, Printing process - typographical. The matt finish vinyl is non-glare at any angle. The labels are designed to fit standard desktop and laptop computer keyboards. If necessary, they can be trimmed with scissors prior to application. For better results please clean your keyboard before applying the stickers.